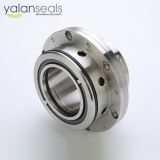 Structural Features: single end, multi springs, balanced, independent rotary direction, still structure mechanical seal. 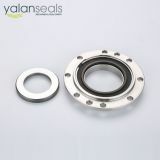 This seal has very small operating length so that it is suitable for replacing outer-framework oil seals for sealing the oil side of the high speed pump gearboxes. All compensation components are pre-assembled as a whole body and the springs will not be able to be fell out. 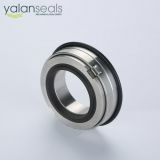 The whole seal is very compact and easy to install. It has very great stability and works well with high speed conditions. Loads on the seal faces are well balanced. 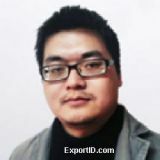 Scopes of Application: widely used in different types of oil, water, acid and alkali operational conditions. 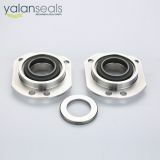 This seal component was designed for high speed pumps, blowers, decelerators, gearboxes, and rotating joints. Mediums: water, oil, acid, alkali, and other corrosive mediums. INQUIRY ABOUT YALAN H10 Multi Spring Super Thin and Balanced Mechanical Seal for High Speed Pumps, Blowers, Decelerators, Gearboxes, and Rotating JointsAnhui YALAN Seal Component Co., Ltd.